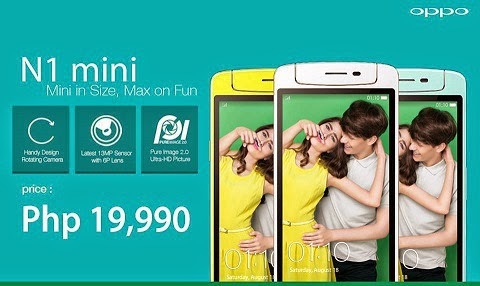 The OPPO N1 Mini will be available in the Philippines for Php19,990 in September this year. The N1 Mini has a 5-inch HD display in 294 pixel per inch density. Powered by a Qualcomm Snapdragon 400 chip which clocked at 1.6GHz with Adreno 305 GPU. The device also have 2GB RAM plus a 16 GB onboard storage. Running on ColorOS 1.4 or Android 4.3 Jellybean, the new mobile equipped with Swivel-type 13 megapixel auto camera with LED flash. In addition of the specs above, the Oppo N1 Mini's connectivity support 4G LTE, HSPA+, 3G, Wifi, NFC, Bluetooth, GPS and A-GPS. For under 20K price in the country, the mobile carried a 2,140mAh battery.